Calling all tequila lovers, this one is for you! Juice one orange and two limes to measure 1/4 cup juice each. Combine juices and sugar in a microwavable bowl. Microwave on high for 2-3 minutes or until sugar is dissolved. Thinly slice remaining orange and lime. 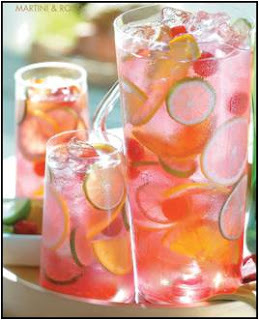 Add ice, juice mixture, orange and lime slices, raspberries, tequila and triple sec in a pitcher and stir. Add champagne and soda, stir gently and serve!